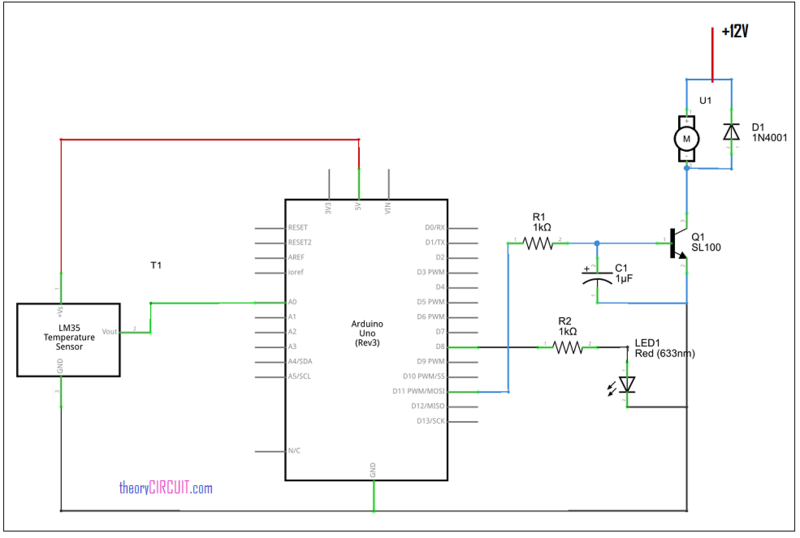 This circuit constructed with Arduino uno board as a main part and LM35 as a temperature sensor. The output from sensor is directly connected with analog input A0 pin of Arduino board, and the LED1 is connected with digital pin D8, the output is taken from the D11 pin of arduino, here you can choose any digital pin with PWM function as a output pin, remember to make those changes in arduino program code, here the code given based on D11 pin as a output. Whenever the temperature sensor detects the changes in temperature outside the Arduino varies the PWM output at D11 pin hence the speed of fan varies, here the SL100 transistor acts as a switching transistor. Sir, it is very useful. I need more clear details of it as i am doing my first project. Can u please mail me. Thanking you sir. look at the output digital pin and fan connections, it might work. sir, can i replace fan with a light bulb to control the amount of current to the light bulb? how can i implement it in simulink matlab with arduino support package blocks. Is there any particular reason why the readtemp variable has been defined last? I am trying to adapt this to work so that the fan will run at cooler temps at varying speeds, slowing to a halt at ~24C.